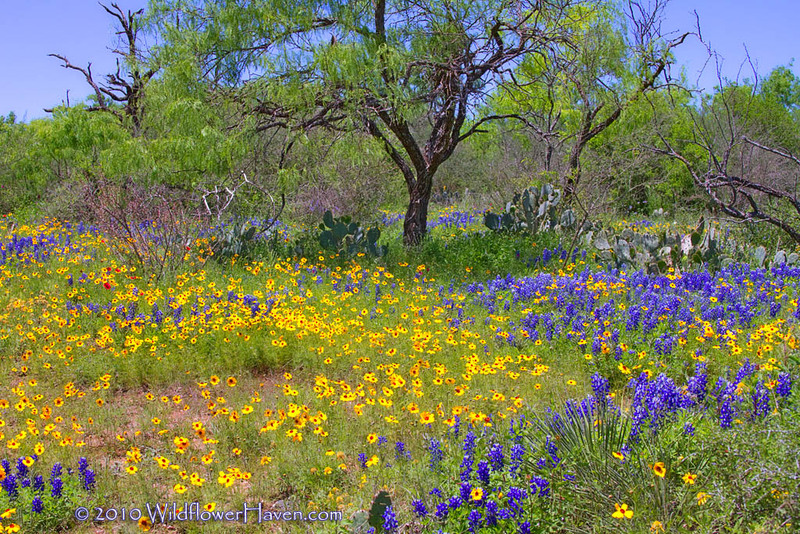 Home Wildflower Seas... Texas When Should I Come to See Texas Wildflowers? When Should I Come to See Texas Wildflowers? During years of normal to above normal rainfall, you can find wildflowers blooming in Texas throughout most of the year. 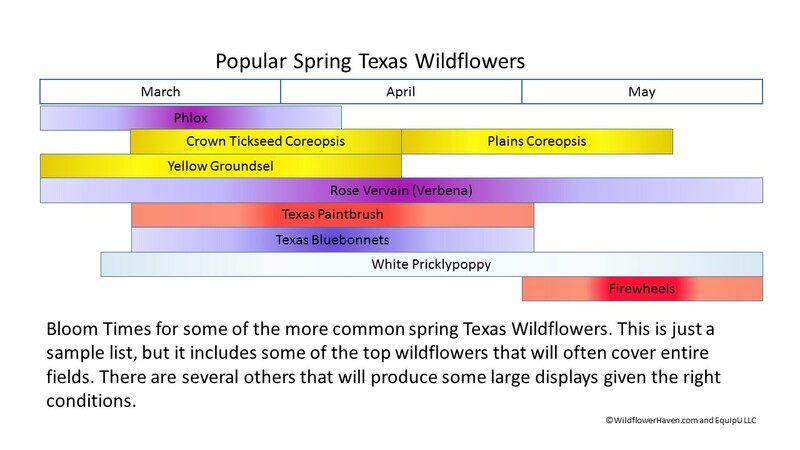 The more popular times to view wildflowers in Texas are the months of March, April, May and June. The fall months of September and October can also have fairly large displays of wildflowers like gayfeather, snow on the mountain, Maximillian sunflowers and asters. Most folks come to Texas to view the fields of blue created by the Texas Bluebonnet. The two main species of bluebonnets that adorn our roadsides and fields in the spring, germinate in the fall and grow to rosettes about the size of the palm of a hand or small salad plate before “wintering over” while building their root systems. When the nights begin to warm and the rains return in the spring, the bluebonnet and other wildflowers get the signal to begin their advance into the Texas landscape. If the temperature and rainfall are just right, bluebonnets will start to bloom in late February to early March. Usually only a small percentage of bluebonnet plants will bloom before mid-March. 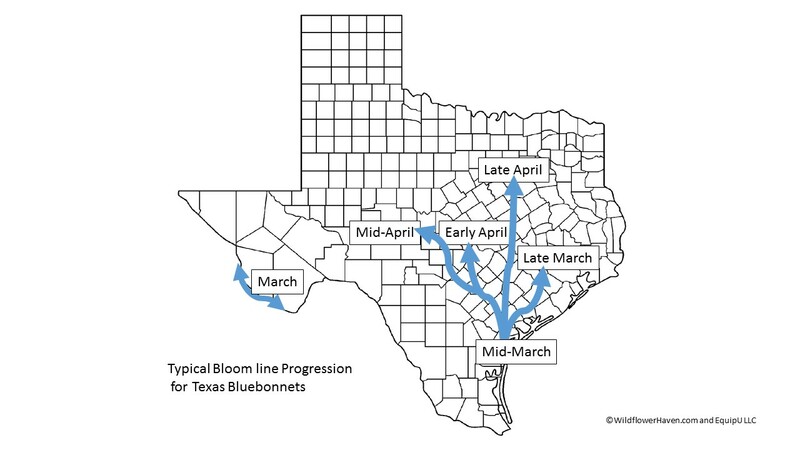 Historically, the peak of the bluebonnet season is between the last week in March through the end of April, but this depends on location in Texas. The “bloom line” usually follows the warming temperatures, starting in the southern coastal cities and moving north and east along the Gulf Coast. As the bloom line approaches the higher altitudes of the Texas Hill Country its westward direction slows while its northward direction speeds up. Areas like Mason County in the western hill country will often peak around or after mid-April which sometimes is about the time the bloom line reaches Ellis County which is just south of Dallas. The key factor in when and how long most of our early spring wildflowers bloom is sun and average nighttime temperatures. A warmer and drier than normal spring will result in an earlier and usually shorter flowering. A cooler and wetter than normal spring will result in a later and usually longer flowering. This difference in time and length of season is normally only a few days to a week at most. Exceptions to the general rule do happen. If you only have a week to spend touring our Texas wildflowers, then I would suggest setting up base in either Austin or San Antonio during the first two weeks of April. From either location you can venture out to spots in the Hill Country, South Texas, and Brenham during day trips (I have done it many times over the past 15 years). The parade of Texas wildflowers begins in February with the windflower (anemone) species. These small sometimes inconspicuous wildflowers are heralds of the coming spring. Soon the sounds of springs rise up like the overture to the concert of colors to come. The first to usually cover the stage with color are phlox, groundsel, verbena, and crown coreopsis. Then as if the sun and sky fell to earth the Texas paintbrush and bluebonnet spread the hues of blue and red across the landscape. Then other wildflowers dance across the stage of red and blue dotting it with white and yellow. By this time the air is filled with the melodies of birds, the buzzing of bees and the fluttering of butterflies. Nothing that I have found on earth to this date can compare to the calming yet thrilling feeling I get when I look across a Texas landscape covered with wildflowers as the morning sun breaks. If you have the ability to spend a week or two in one of the top wildflower areas of Texas, hopefully you will experience what I have. Once you do, you will then understand where the true heart of Texas beats. Without the wildflowers there would be no pollinators like the hummingbirds, bees, butterflies, moths, bats and ants. Without the pollinators our crops would fail and we would perish. With that in mind, please support the efforts of the many nature centers/organizations, Texas state and local natural areas, and the Lady Bird Johnson Wildflower Center to preserve our beautiful Texas wildflowers for the future generations to come. Stay tuned for our 2018 Spring Wildflower Forecasts coming late January with a follow-up in March.